For the benefit of Mr Kite, here's a picture of a backyard. I say "a" backyard, because I'm not sure that "the" backyard is a real place. The name may be inspired by the backyard of my childhood (partly pictured below), which was a place of magic, adventure and tree-climbing. 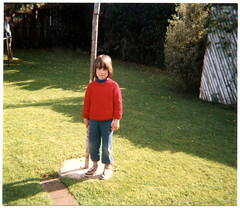 That backyard no longer exists, being now home to a large carpark. That's another story altogether, and one that has on occasion given rise to melancholy quotations of Joni Mitchell's 'Big Yellow Taxi': "they paved paradise and put up a parking lot." 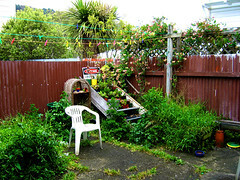 The above backyard is located at the flat in Mt Victoria out of which I recently moved. It may not look like much, but it's a really nice yard, and we had a lot of good times there. There are a lot of weeds, giving a nice green feel to the otherwise rather concrete aesthetic. Please note the lovely specimen of cordyline australis just over the fence. I do like my cordyline australis. Also note the bits of creeper growing on the trellis - I 'stole' them from the neighbours. Heh, cunning. The plants on the staircase are mine: a variety of succulents spawned from cuttings my brother gave me when I first moved into the place at the end of 2002. Which reminds me, I must relocate them to my new yard. There will be pictures of the new yard sometime soon. Whether I talk about myself too much. On reflection, life isn't too bad. I think as long as you don't turn into an 'earnest, pasty-faced white man' you should be spared from the MediaCow wrath, as unnecessarily bitter as it seems to be. Given that half the posts on the mediacow site seem to be infights between people no-one has ever heard of, and seem to only be important as a result of those fights, the phrase pot kettle black came to mind when I read that. The other half is political commentary of various sorts, and the interweb is, of course, desperately short of that. I like reading "human" blogs, blogs about people going about their lives. Or wierd automated ones like mine which have bread recipes mixed up with film-watching and book-reading notes but otherwise little of the human. That's because I'm really an alien. HAh! Hadda laugh when i saw the cheap plastic chair, there. WE've got exactly the same model. Ah you're all lovely people. If I may draw your attention to the far right of the picture, you'll note the green frisbee, which is held together with masking tape - that was a birthday gift from me to Nick-o-love, who promptly hurled it against a telephone pole and broke it. Yes you Nick! But don't worry I still think you're great. Where are you, anyway? The more I view this picture the more I get jealous that my backyard doesn't have anything nearly exciting. We do have the undergrowth bursting through the concrete, but the only other feature is a rusty clothesline. How was the South Island? Did it behave?!? I'll update soon... at least a few pictures anyway. I'm too tired and busy catching up on stuff to do it just yet... but soon.